After my difficult passage from Sea Palling to Wells I decided to get a bigger anchor. I did not feel safe sleeping on my 6kg Bruce in a very shallow bay in choppy water in the remnants of a hurricane, no matter how tired I was. Well, I got a bigger anchor. A much bigger anchor. I stumbled upon some quite impressive videos by Mantus Anchors on their YouTube channel. You’ll find plenty of people contesting their results in the comment section, but I could see this was at least a decent anchor. What really attracted me, though, was that it could be packed flat. 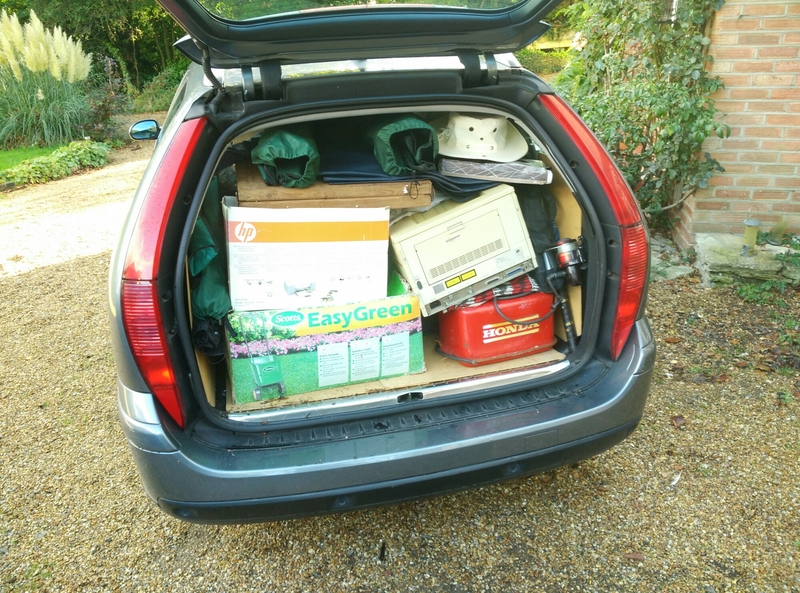 I did a few measurements and ordered the largest I could fit aboard — their 11kg model. 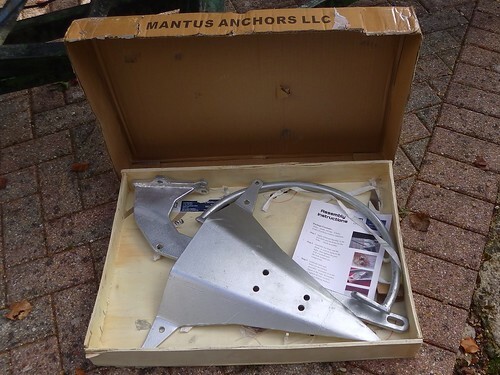 And when their European distributor didn’t have it in stock, Mantus shipped it from Texas at no extra cost! 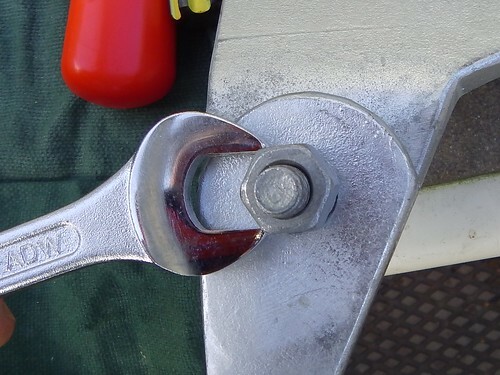 The only problem I had were the inconsistent nuts on this anchor. Not only were they Imperial — not surprising given it came from the USA — they weren’t all the same size! I replaced them all with 316 stainless M10 bolts, nuts, and spring washers from Sea Screw. 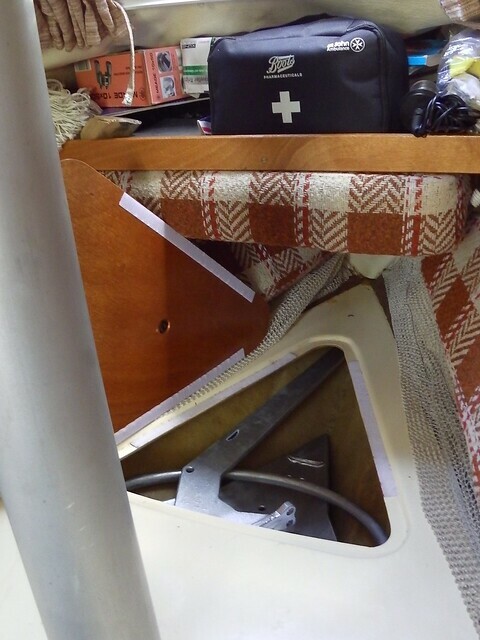 Initially, I kept the Mantus in this triangular locker forward of the mast. But then I realized I could pack it into the anchor locker alongside my 6kg Bruce, chain, and rode, so that’s where it lives now. Here you can see why this anchor is so great for Tammy Norie. There’s simply no way I could fit an equivalent-sized anchor in her locker. Especially not alongside her normal anchor. Using it obviously takes a little planning. You have to put it together with a spanner (one is enough) and transfer the chain and rode from the Bruce using a shackle key. 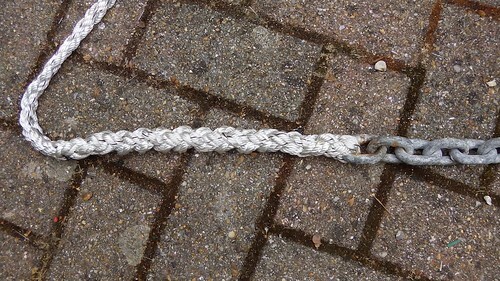 I have 10m of 8mm chain and about 40m of heavy anchorplait rode, that I joined with this splice. Yarrr! I’ve held off on posting about the Mantus because I have not really had a chance to test it in difficult conditions. 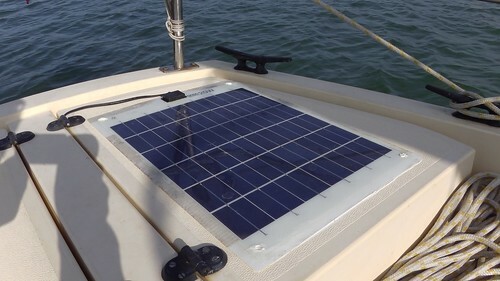 I did use it when I left Tammy Norie at anchor for a week in Poole Harbour when gales were forecast, but she was also under the watchful eye of Tim McCloy on China Blue. But after showing it off to Chris Boxer on Emmelène, I thought I might as well tell you all about it. One of the greatest risks for a solo sailor is falling off the boat. When I’m sailing alone in all but the safest conditions, I’m wearing a lifejacket. I also clip on, especially when the autopilot or self-steering gear are engaged. What a nightmare it would be to fall in the water, away from shore, and see your boat sail away from you, suddenly freed of your weight! Even if you’re clipped on it’s very difficult to get back aboard. When Tammy is at rest I’m able to haul myself up onto her side-decks, but not over the transom. And what hope is there that I could reach a side-deck if she’s sailing? 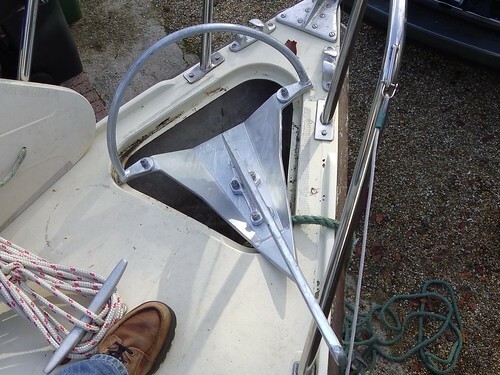 So I’ve taken an idea I’ve seen on mini-Transats: a permanently installed elastic step at the transom. The trick is to use some webbing tube threaded with elastic cord, strung across the back of the boat. 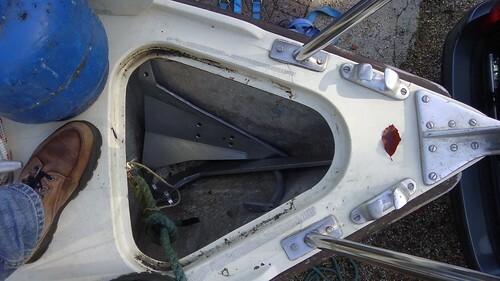 The elastic should be taught to keep the line out of the way, but the webbing should be long enough that it forms a step that you can reach to get back aboard. 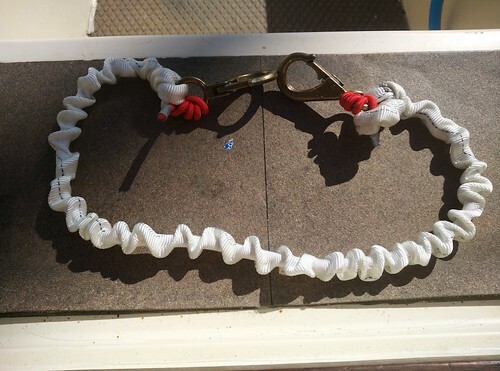 Here’s the step strung between the drogue attachments at on Tammy’s quarters. It should be fairly easy to reach from the water, even if I’ve had to haul myself along the safety line to catch up with the boat. The elastic keeps it out of the way of things like the self-steering gear. Here it is again with me standing on it. I’ve adjusted the length so that my waist is at the height of the pushpit rail, allowing me to bend forward and flop into the cockpit even if my arms are exhausted. It’s one of those things I hope I’ll never need to use. It was easy to put together and might save me. I might even be able to test it (with some help). I studied the plans I received for the Hebridean wind vane self-steering gear carefully. I really wanted to build the whole thing from scratch, but I realised that I don’t really have the time, especially if I’m to get used to sailing with it before next spring. So I ordered a kit. The kit still doesn’t allow me to just bolt together the Hebridean. 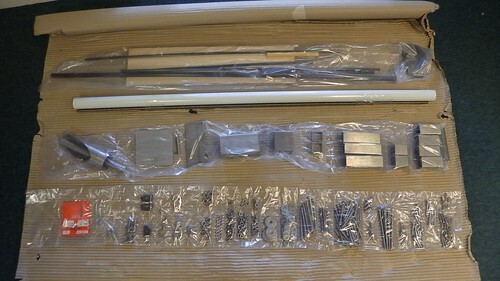 It contains all the fastenings, some tricky-to-source bits, and stainless steel joints cut to length, but not to shape. I’m getting some American white oak for the frame and pendulum from Bamptons in Southampton. 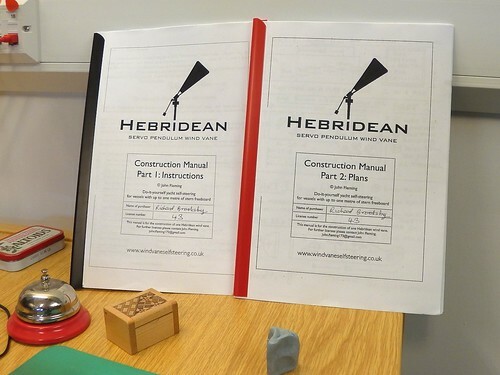 John Fleming, designer of the Hebridean, said it could be built in a week or two if “you’re good at that sort of thing”. Well, I don’t know that I’m good, but I’ve taken a week off work from 2015-07-20 to get as far as I can. My goal is to have the self-steering gear working before August. Progress will be interrupted on 2014-07-23/24 by a meeting of the Small Sailboat Club at Ashlett Creek. 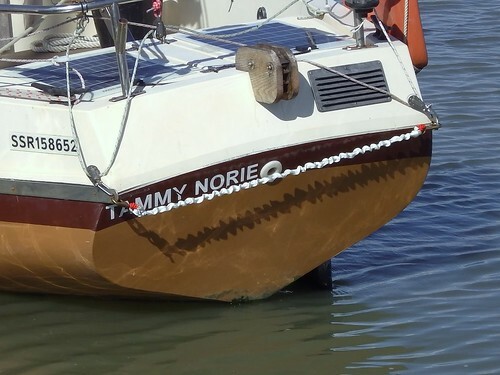 I plan to sail Tammy Norie there from Fareham. That’s a bit awkward as I have to both leave Fareham and arrive there near high tide. I’m sure I’ll figure something out. 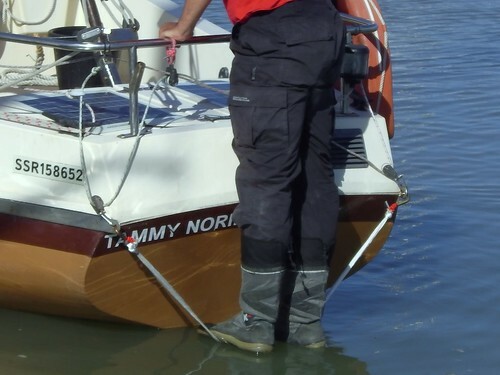 If I’m to solo sail Tammy Norie any great distance I’ll need self-steering gear. 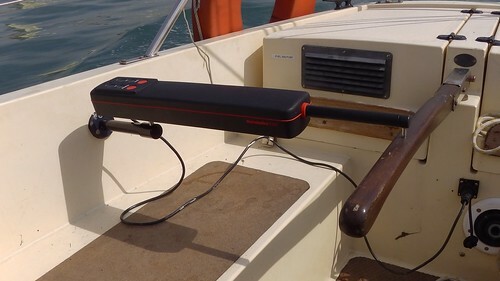 I already have an electrical tiller pilot (a Raymarine Autohelm 1000 Micro Tiller) but it uses quite a bit of power and is quite noisy. Also, it’s a good idea to have backup. 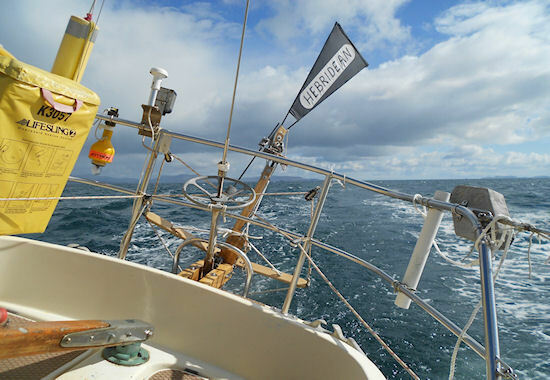 Wind vane self-steering is common on long-distance boats and especially junk rigged boats. It uses the direction of the wind and the forward motion of the boat to steer, keeping you going at a constant angle to the wind. 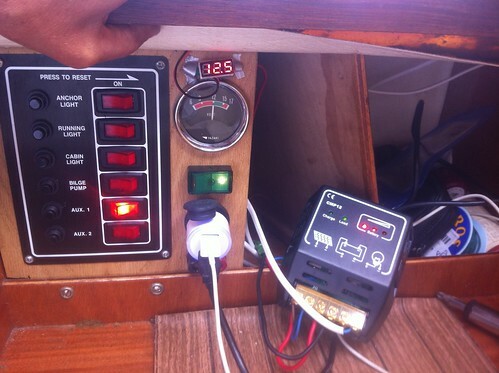 There aren’t many self-steering systems that will work on a boat as small as Tammy Norie. Roger Taylor uses the Pacific Windpilot Lite and swears by it. That was my plan too until I saw the Hebridean in an article in Practical Boat Owner. 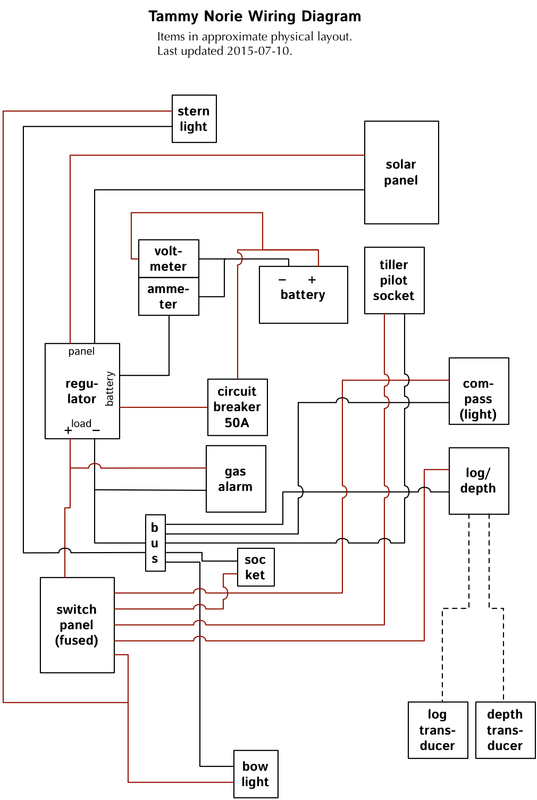 It’s a cunningly simple design that I can build myself at a fraction of the cost. This appeals to me because I’ll learn a great deal by making it, and I’ll be able to maintain it myself. Saving half the cost of the boat is also important! After quite a long correspondence with John Fleming I ordered a copy of the plans and they arrived today. I’ll be documenting my progress with building and using the wind vane here on the blog.